I was told that in order to get the astronomical equipment to the top, building stairs was out of the questions, as much of it was so heavy that you had to wheel it up. So Hans van Steenwinkel constructed a paved walkway that spiral itself to the top of the tower. 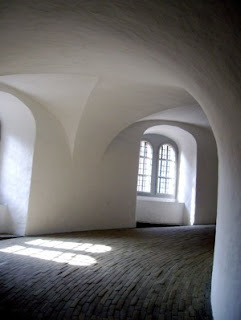 I have never seen anything like this on my travels, and it is intriguing to circle yourself around the core of the tower until you get to the small, narrow spiralled staircase that brings you up to the observatory deck. You are left with one question. If the equipment had to be wheeled up, how did they get it up on the deck?